Primary Natural Resources petroleum, natural gas. THE UNITED ARAB EMIRATES (UAE) is a federation of seven emirates in the Arabian Peninsula, established in 1971 (formerly six, the seventh acceded to the federation in 1972). 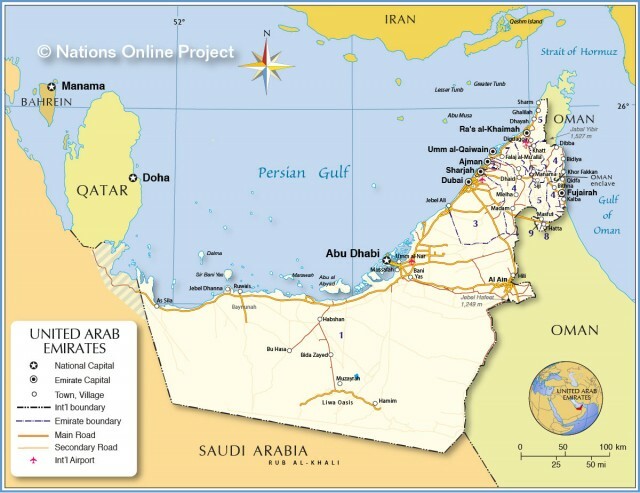 The seven emirates (known as Trucial States)—Abu Dhabi, Dubai, Sharjah, Ajman, Umm al-Qaiwain, Ra’s al-Khaimah, and Fujairah—are located along the Persian Gulf coast of the Arabian Peninsula. QATAR lies to the west, SAUDI ARABIA to the south and west, and OMAN to the and east. Four-fifths of the land is desert. Towering dunes, rising to 656 ft (200 m), form part of the Empty Quarter, or RUB’ AL-KHALI desert, at the southern border. To the northeast, the sand and gravel desert extends toward the jagged Hajar chain that splits the country from north to the south in the Northern Emirates. To the east is the solitary mountain of Jebel Hafit. Rocky slopes rise to 4,200 ft (1,300 m), falling steeply to the east coast where a fertile gravel plain borders the water of the Gulf of Oman. Sandy islets, sea grass beds, mangrove, khors (tidal inlets), and sandy beaches abound along its coast. The UAE’s main industrial activities, apart from the oil and gas sector, are construction, aluminum, chemicals, plastics, metals, heavy equipment, food, clothing and textiles. The services sector accounts for 49.3 percent of employment. Hydrocarbon reserves now stand at 97.8 billion barrels of oil and 212.1 trillion cubic ft (6 trillion cubic m) of natural gas, accounting for 12 percent of the world’s total, with a crude oil production’s daily average of 1,900,300 barrels. On the worldwide stage, these figures rank the UAE in fifth place in terms of size of its oil reserves and fourth with respect to its natural gas reserves. Abu Dhabi has 94.3 percent of the UAE’s total reserves; Dubai is focusing especially on development of trade, tourism, finance, and communications; Sharjah continues to focus on textiles and light industries; while other Northern Emirates have continued their investments in agriculture, ceramics, cement, and maritime industries. A plan for Dubai’s tourism expansion is based on 10 million people visiting Dubai as tourists by 2010, while passengers transiting by that stage is expected to exceed 30 million (70 million in 2020). Projects such as Dubai Internet City, D. Media City, and Techno Park will be joined by a financial “free zone.” Dubai intends to construct the tallest tower in the world, exotic islands in the sea, a skier’s paradise in the desert, and a hotel underwater. The UAE is one of the world’s top breeding centers for Arabian horses.